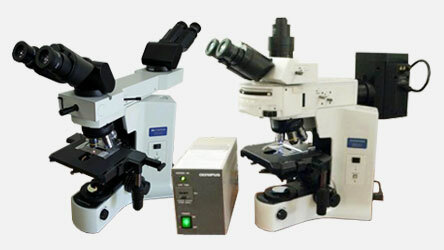 Munday Scientific Instruments is a full service microscope maintenance and repairs company. We perform preventive maintenance on a broad range of microscopes and microscope accessories, and are authorized service technicians of Olympus and Nikon brands. Our services include cleaning and calibration of your instrument to ensure it is operating to the best of its abilities. Routine preventive maintenance, usually on an annual basis, is the best way to keep your microscope and all of its parts operating long term. We can also incorporate service contracts to ensure prompt timing of annual services. Many facilities require by law an annual preventive maintenance of medical equipment performed by authorized technicians. Whether you have one microscope or several, we can provide the services you need, and often travel throughout the eastern United States to meet the needs of our clients. The staff of Munday Scientific Instruments is also highly experienced in repairing microscopes and their mechanical parts. When performing routine service, we check each device for needed repairs and address any issues we may notice that could lead to future problems. Most repair work is done on location for your convenience. If necessary we can carry your equipment to our facility for repairs and return it to you as soon as possible. If we are unable to come to you in person for a needed repair, we gladly receive equipment if it can be safely packaged and shipped to us. We have access to all major shipping providers and can discuss the best option for you and your microscope. I appreciate the quality service and high level of integrity that Munday Scientific Instruments (MSI) provides. I have just purchased my second used microscope from them. The first was an Olympus BX-51 bright field, phase contrast microscope. This second one is the same but with fluorescence capability. Both microscopes are immaculate and the optics are perfect. Speaking with Scott and Chad, I have come to understand the care they take in testing each component. I spent over a year shopping for the first microscope on the used market and I must add that MSI prices are very fair, especially when compared to other vendors I have researched. When something is not correct, MSI fixes it immediately, for example I thought they had forgotten to send the power source for the fluorescence illumination and without questioning this, they immediately sent me another one. I have since found the original one and will be sending it back soon! It is a pleasure working with them and having MSI as my microscope and accessories supplier.